Each state wants to be the first to establish it’s infrastructure to support offshore wind farms. 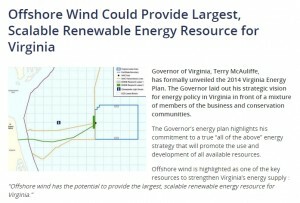 Virginia, much like Maryland, is pushing the renewable energy mix and offshore wind shows to be the most scalable. The state or states who successfully get out in front will gain a strong foothold and secure jobs and project revenue as a hub for offshore work – even in the other states.